What brought me to "listen" to this book was my Dad. I was sitting on the couch watching the Sound of Music *snore* with a very passionate friend when Dad came in and said he'd give me $50 to detail his car. Okay, some of you may be thinking woah man, that's too much!! I was half thinking that (as my parents don't normally pay me to do jobs), however part of me was like no Dad, it's not worth it. Becauuuuuse, my Dad is a farmer, and the work ute is always, always in a horrible state. Take what you think is dirty and times it by ten, say. It took me three hours and a lot of listening, but I got there in the end. Annndd, he actually paid me! Woop!! So the story, right, well... It is a true story told from Sally Nielson who is the fiancé to Sam Goodard; hunky football playing graduate who had eight strokes when he was 23 (I think). 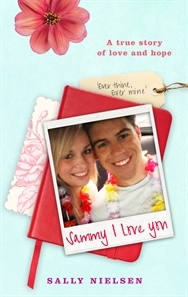 Sally goes into vivid details over the process of Sam's long and slow recovery and reinforces how in love with him she is. It was a very loving and nice story which I enjoyed immensely.